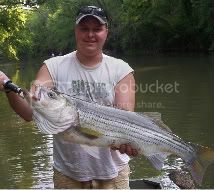 Been super busy the last year, too many irons in the fire, fishing a little, found a population of wall hangers in a lake thats not supposed to have Striper in it in Arkansas, have witnessed three 50+ come from it this last year -- its a hero or zero bite, but if you DO get a bite the fish are all over 40#. Finished up a weekend getaway on the Ouachita river above Lake Ouachita, Arkansas (lots of smallies , but river too warm for Stripes, lake has plenty though) still stuck in Okie land , but looking for more land in Columbia SC area or Celina TN area to build on and retire in 12 years. Went on our annual Salty trip -- still have Red Snapper we haven't eaten yet. Posted: Tue Nov 30, 2010 11:07 am Post subject: Great hearing from you Tony. We sure have missed you on the forum and hope you are able to help us out here. You always have some of the most experience, best educated and researched information available. Columbia, SC over Celina?? What kind of choice is that? Good to have you back Tony... Glad you are getting some fishing in, but hope I beat you in December. Oh GREAT ONE, you have been missed! Sure are glad to have you back. All kinds of questions for you to answer all over the soup. We might be able to dig some up for you! Your input was missed; hope you will post often. Tony is back. Now LMJ can figure out what kind of damn ancient ABU he's got... Welcome back, Cotter! So you've found a lake producing 50's.....have YOU produced a 50 yet? Had my shots back in June, them rocks is sharp. Welcome back Tony. We've missed you. You're time is coming Tony, for what it's worth, I just got the title "schleprock" on the Smack forum, and Chef thinks you can help me with my "ancient" abu. jeez. Welcome back and thanks for the feedback. BTW, Shawn, how can I change the "soup guru" under my tag? I might be a little verbose, but a LONG way from being any kind of guru around here. Posted: Tue Nov 30, 2010 7:32 pm Post subject: Welcome Back Tony! I for one sure have missed ya! Great to have you back. Rumors of your demise haven been greatly exaggerated. Glad to see you back! Posted: Wed Dec 01, 2010 10:13 am Post subject: Now ya done it -- eight ball? Good to see you back around Tony. Posted: Fri Dec 03, 2010 11:50 am Post subject: Re: Now ya done it -- eight ball? Blame Eric, he came up with it and I thought it was hilarious and appropriate. He said "Just shake, and out comes the answer..." hahahaha! !